For years, our home was the place to be during the fall. With lots of land and a huge bon fire pit, hay rides, bon fires and s’mores welcomed our fall guests with all that autumn has to offer. With little children at the time, each year they’d direct me to the kind of fall decor they wanted. That meant lots of kid choice, like stuffed pumpkins with faces on them, funny looking scarecrows and a hodge podge of other items, you know, the majority of the things you now see at yard sales for a quarter. As my tastes have grown up, slowly my decorating style has as well, but since it can be an investment to switch over ones entire decor at once, I’m slowly incorporating new items which I will use the most. I love the process of mixing what I already have, shopping for new things, and thrifting for others. My fall decor is a perfect example of easy fall decor on a budget and I had such fun finding a few gems. Many of you know my affinity for dishes. How can little plates and cups and platters make me so happy? I am not sure, but they do and I find too many at thrift stores. As I enjoyed and wandered through Pier 1, (it’s definitely one of my happy places that I love to get inspiration) dishes continued to call my name, but I decided to shop the house, use what I had out of my many plates and dress up my table settings with these gorgeous napkins. Since I found them on clearance and they didn’t have eight of just the green, I decided to mix and match the green and yellow with a little layering. Aren’t they gorgeous? And those napkin rings? I am not just using them for napkins, that’s for sure. 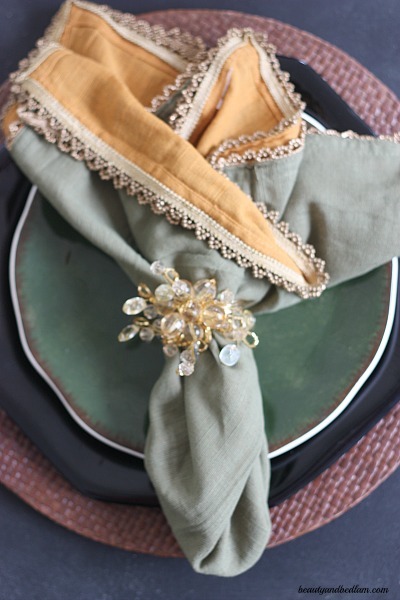 It’s amazing to me how linens can dress up even the most simple table setting. When I start creating a tablescape. I begin by pulling out what I have and start playing. I begin simple and then add to it as the mood strikes. Some suggestions I stick to are highlighted in my Creating a Tablescape post and layering of varying elements is a bit part of that. Typically, I lean towards a beautiful napkin fold, such as this Pinwheel Napkin Fold. It’s so simple but makes such a grand statement. 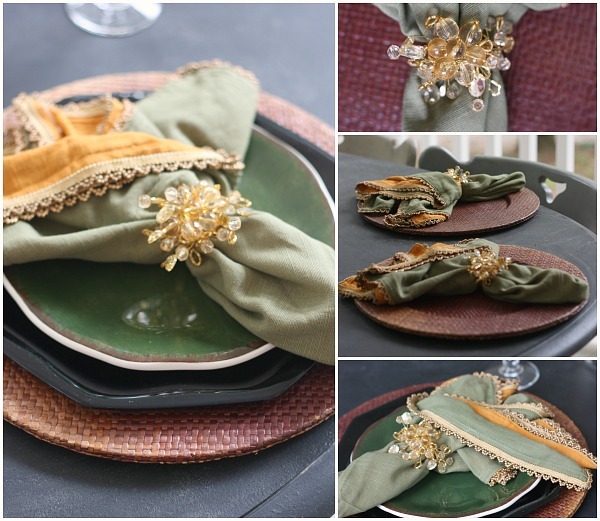 Since my new napkins aren’t made of a stiff fabric, I used those napkin rings, which make this otherwise rustic look quite glam. By adding the gold candle holders, it definitely makes that overall look Rustic Glam. As soon as the leaves change in the next week, I’ll be cutting large branches for a large centerpiece and I can’t wait to create that. Again, since I have to seat so many around my table and there weren’t enough matching napkins, this problem is easily solved by determining that the two head seats will anchor the table setting with a slightly different looks. 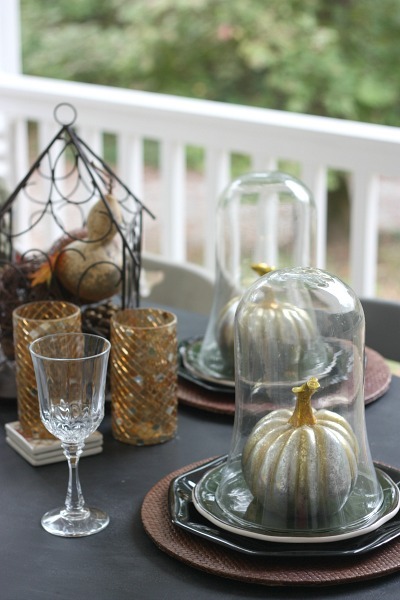 I love these yard sale cloches that cover the beautiful pumpkins. Again, so simple, but elegant. If you have a predetermined mindset that everything needs to match, let it go. There’s such beauty in an eclectic look. 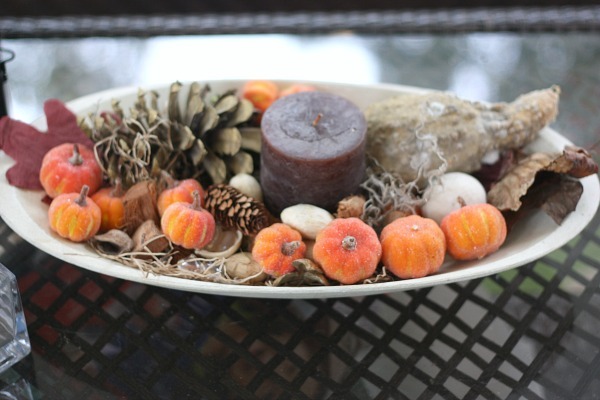 I love adding fall fillers into my yard sale bowls. It so simple to create a gorgeous centerpiece on a budget just by adding in things from your yard, mixed with filler. This is the first year with our new front porch and it will take me awhile to decorate it like I desire. Slowly but surely, it will get there. I appreciate it so much more when it takes a little bit of time. I knew that my first priority was going to be our front door, so a large outdoor wreath was my first purchase. Like every good Southern veranda, it needed a big hay bale with some beautiful pumpkins and mum. I won’t even get on a tangent at what occurred while I was sleeping, but needless to say, our naughty dog had a field day. This is only a small remnant. GRRR! My mantel is still a work in progress, as I need to swap out the white candles and middle picture. This year, I decided to layer a brown shutter I found at a yard sale just to give it a bit of an autumn feel. The glass candle holders are favorites because they can be dressed up for any occasion. 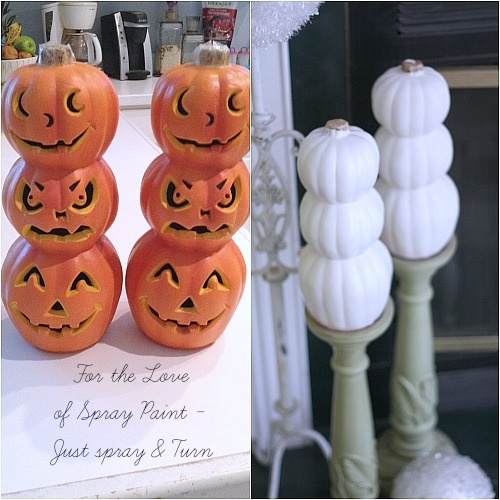 If you are wanting to add a few more fall touches, don’t forget the power of Spray Paint. These were some scary, plastic $0.25 jack-o-lanterns that got new life with some Rustoleum Heirloom White Spray paint. Now, I LOVE them, don’t you? That’s just a sneak peek of some of the fall fun I’ve been having around my house. Honestly, have you been to Pier 1 recently? It just sparks my creativity the longer I am there. Since there’s a store near where my kids take co-op classes, I’ve been popping in more frequently just because as soon as I enter, it relaxes me and gives me such a vision for my home. Yes, I love everything in that store. I would probably get something for my bedroom. It has been a long work in progress, tackling clutter, making things fit, and making do. I can’t wait to be done! Followed on twitter, I’m meghan_mrm . I love Pier One Imports! I can’t choose JUST one thing I’d want to get… definitely would start with CANDLES! I’m with Patricia – candles! I love Pier 1 – haven;t been there in ages, but I remember their candles and what a statement they make! I love your new napkins – so elegant! We use cloth napkins every day and they are getting stained, so I might look for some pretty new napkins too … hopefully on clearance like the ones you found! I follow you on Pintrest and I pinned this great giveaway too! I follow on FB and just shared your giveaway! Whew! I think that’s it for now – I don’t have a cell phone so I can’t follow with Instagram ( though I’d love to!) – so I’ve done what I can! Now wouldn’t it be fun to win? It’s our 22nd anniversary today, so I’m really hoping! I’d love to buy a wreath! I follow you on Pinterest and pinned your overnight cinnamon roll recipe to my breakfast board. I would definitely get something fall themed for my kitchen. I would love to get some new outdoor decorations…doormat, wreath, etc. I would buy something for my mantle. It is in need of some attention. It looks like a blank canvas that needs to be decorated. I would probably head over to the pillows! I follow on Pinterest and Facebook too!! That’s how I found out about your cool giveaway!! Something new for my living room shelves. They need a pick-me-up:o) Thanks for a great giveaway. I would buy some candles, a rug, and something for my kitchen if I win the gift card to Pier 1! Yay! SO I completed one entry! I would like to purchase something for my wall. My walls are so dull. Mostly old 70’s paneling downstairs an it’s not very warm and inviting so I try to perk it up with photos, etc. Or maybe some new napkins. Most of my cloth napkins are old and I love the ones you found. Thanks for the chance to win! I would buy a really nice Thanksgiving centerpiece! With $50 I put it towards nightstands for our 3 kiddos. Great giveaway. Thanks for the chance to win. I would love to buy a cloche or two because everything looks good showcased under one! Pillows. I need some decorative pillows for my living room! I would purchase some fall deco for Thanksgiving, including the amber glass pumpkins. And I subscribe to you on bloglovin. I love the Pre-Lit Grapevine Pumpkins & Gourd. I’d be looking at Pier 1 chargers. Thanks! I subscribe by email. I’m greatly enjoying your 31 days posts. Thanks! I would probably buy some candles in holiday shapes and scents!! I like you on FB and shared the giveaway! I don’t know, I think a mirror. I subscribe to your emails and enjoy each of them. 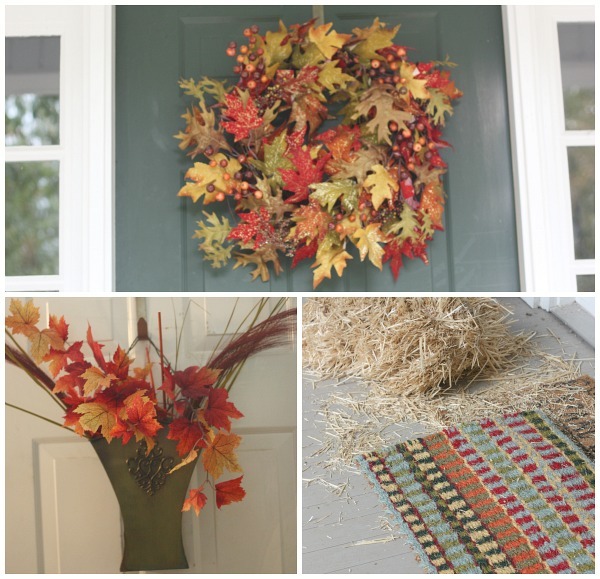 I would love to have a beautiful fall wreath like yours for the fall season. I would love to get some fall cloth napkins. Or something for a centerpiece. With a gift card from Pier 1, I would purchase new candles for the mantle. I LOVE Pier 1’s candle selection as it is the best ever! Hi, Jen – I am one of your email subscribers! I would get pumpkin candles and napkins. This is what I pinned to Pinterest! I really need a tablecloth to use before I get a chance to refinish the table. I follow you through e-mail, Pinterest and Facebook. I love your writing stories and their finds. There are so much items I would buy at Pier 1. I would love to use the gift card to help decorate my teenagers room. I would buy some new dishes. I’d love to get some fall dishes! I am on your email list, thank you. I do follow you on Pinterest and “liked’ you on FB. I would get candles for my fireplace. I would buy a fall wreath for my front door. I subscribed via email . With the GC I would buy Christmas goodies! I would buy placemats and napkins in fall colors. I would buy a fall wreath! I would buy new place mats possibly or candles or a new lamp for my living room. I love this store, it would be hard to decide. Thanks for the giveaway. I follow on pinterest and have pinned many of your awesome recipes. I love the London broil one and use it often. I would get a new set of dishes for Thanksgiving dinner! I love your posts! Great ideas and Godly mothering insights. Thank you. I would love to get some ceramic pumpkins. I would pick out some dishes. I’m redoing my living room and I would purchase some accent pieces in blue. I pinned your post about making a battery-powered lamp. I would use the card for some Christmas decor…not too far away and I could use some fresh things. Thanks for the contest. I love the placemats and napkins as well as the dishes. I would love to get some new table linens! I follow by email! Love it! I need a new mirror. My son broke mine, and I keep forgetting to replace it. I would get some fall décor. Too hard to pick as I want it all! LOL! Thank you for the giveaway! I would love to win a $50 dollar gift card to Pier 1. I would use it to buy some pumpkins and fall decorations to use for a centerpiece on my kitchen table. Pier 1 is wonderful! I already subscribe by e-mail and LOVE your blog. I look forward to it!!! Thank you, Jen! oh wow! This is awesome and just wanted to tell you I LOVE your décor! I am looking for new curtains for our bedroom so that’s what I would look for with a gift card to pier one. I am already currently subscribing! I follow you by email & pinterest! enjoy your blog very much because I am a thrifter as well! I’m an email subscriber. I love Pier 1. Thanks for the chance to win. If I were lucky enough to win the gift card, I would probably buy a lantern or an owl. I keep seeing those and think it would freshen up my house. Thanks for the chance to win. I follow you on Pinterest and if I win the gift card I would buy autumn themed pillows for my couch-it could use a pick me up. I am an email subscriber. I would love some new candles! My Pier 1 item of choice would be a new chair for my office so I wouldn’t have to keep borrowing one from the kitchen. I am now following you on Pinterest. I have pinned the “Give Thanks” décor for over the door décor. Liked you on Facebook and Shared the contest on my page. My shopping list is full of possibilities: the amber gourd, pumpkin salad plates, pumpkin covered bowls, and the gratitude napkins are near the top. I would get some throw pillows for my couch. Thanks for the chance to enter. Love Pier 1! 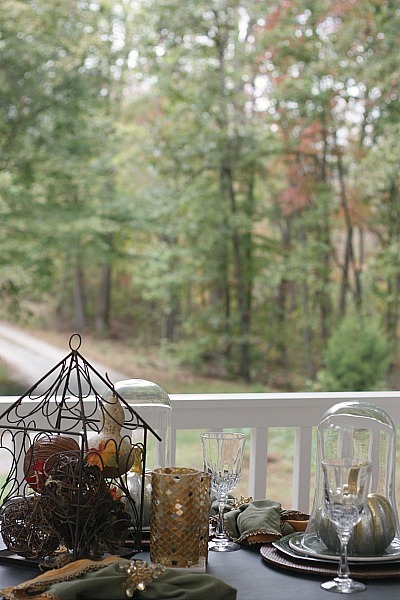 I would buy Fall linens for the table. We are moving to a new home in a couple weeks, and I am finally getting a dining room . I want to dress it up for the Fall holidays. If I won I would either get throw pillows or maybe a small rug. Definitely lots of choices of wonderful things to buy at that store. I would get napkins and fall decor. FB follower. I’d buy candles. Liked on FB, followed o. Pinterest. I am finally decorating my living room and would love to find some fabulous throws or pillows for my living room. I would shop for a new rug for my bedroom. Thanks. I follow you on Pinterest and pinned this post. sebh on Pinterest. I follow you on FB and shared this post. I am a sucker for dishes, too! That’s almost always what I end up buying. But I’d love some pumpkins and fall things to decorate with. I have very few of those things. Oh, I don’t know. I would love a new mirror, or maybe some wonderful frames. I am an email subscriber ~ thanks! Maybe a new rug for the front door, the old one is sad! Thanks for doing this giveaway, Jen! Throw pillows. I have a neutral sofa and switch them out for every season and I would love some new ones. I really need a decent fall wreath. I would buy some things for my kitchen table. Plates, decorations, etc!! Just signed up to receive your emails too. I would buy a vase. I like their Mosaic Vase – Champagne & Gold. I would love to get a fall or Christmas wreath. 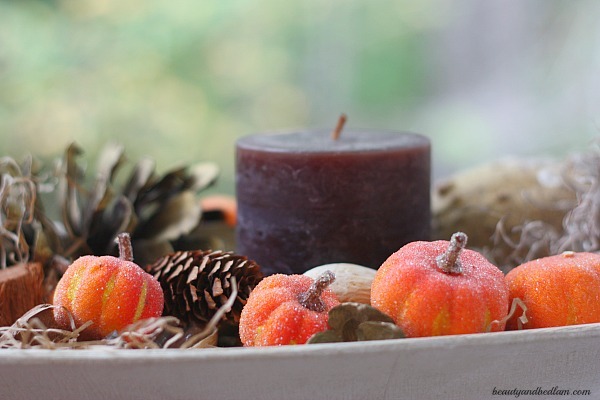 With my gift certificate, I would buy a fall wreath for the door and some fragrant candles – I love scents such as cinnamon or pumpkin for the fall. I would love a wreath for my front door. Need some new mantle decor – something shiny! I like you on Facebook as Elena Istomina. I love Pier One and would love to get some candles! I’d like to get new charger plates. I would purchase serveware and tabletop accessories. I am in dire need for a wreath for my front door! I would love something for my living room! thank you for the opportunity. I’d love to get the Coastal Shells Wreath! It’s so beautiful. I would use it for my daughter to get something for her room. I would buy a few pillar candles for my breakfront. I would buy some things for a fall centerpiece! I love the napkins with the cute napkin rings! Hoping to win! I love this store! I would get some pretty entryway hooks or livingroom organizers. I repinned a post- I already follow on Pinterest. And I subscribe with my blog email address, not this one. Hope that still counts! Some new placemats or a new tablecloth and napkins. Probably use it towards the Faux Fall Berry Wreath! The pedestal mosaic bowl would be a beautiful place to keep fresh fall fruits on the table! I’m a sucker for candle pillars! I would buy a lamp with the gift card. I would get some new placemats – it’s where I got our old ones, but SOOO long ago; they have done their duty and are ready to retire! I would get a new set of dishes! I think that fragrance is also a large part of decorating. I love Pier 1’s reed diffusers – with ember being my favorite fall fragrance. As a side note I saw the most beautiful scarf slidders at a store awhile back. While I was admiring them the store clerk told me that they were napkin rings. Another use for your pretty napkin rings. I’m an email subscriber. I don’t know what I’d buy – I haven’t been in there since the beginning of the summer. I would start with candles! I would probably buy the Reindeer Pillows – Love them!! I like Balancing Beauty and Bedlam on FB! I would probably give the gift card to my mom, she loves to organize and this would be great for her!!! I would buy a nice wreath for my door! Would love to buy something to decorate my mantle over my fireplace. I would buy fall decorations or pillows. I would buy new dishes to go in my newly remodeled kitchen! Love new plates & tablesettings! I like Beauty& Bedlam on Facebook! I get your email newsletters and always look forward to seeing them in my inbox! I think I would look for an entryway rug, as the one I have leaves a lot to be desired! I would buy a new tablecloth and or kitchen towels. Pier One has so many cute Fall things! 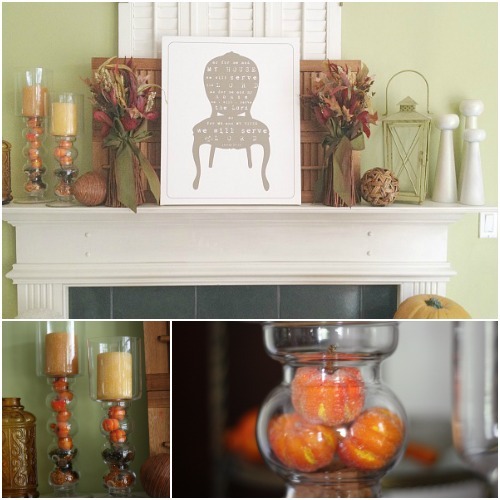 I would probably get something that I could use on my mantle or table to bring some Fall cuteness to my home! Thanks! I would buy the pretty fall wreath I saw there the other day. I would definitely buy Christmas décor! I love all of the sparkly Christmas stuff Pier 1 carries! I am not sure just which item I would “purchase’ as this is just one of those kind of stores that just shopping in it is a great way to enjoy life! all that imagining.. planning. hoping and wishing.. a great day in deed. of course if i were able to actually have an item from the store. that is and of itself is a joy! I follow you on Facebook ! Have an awesome day! I would put it toward a pretty chair for my family room! Something for our bedroom. We’ve been our house for a year and I still have nothing on the walls. I would buy a random assortment of fall decor and my house is seriously lacking in decor for my favorite season of the year. I would buy a new fall wreath for the front door! I would look for a new Fall doormat or some floral accents to add to bowls and vases around the house. I lost my job in March and am still recovering from two back surgeries earlier this year. Asian Spice candles are my weakness. With no income though I have been unable to indulge. I think I need some of those to assist in my recovery. Aromatherapy might be the thing to knock me out of this depressing mood. Win or lose, Asian Spice it is! I would love some new pillows! Subscribed, commented, and followed. 🙂 I’d buy something for my fireplace mantle. I am usually to cheap to change out décor for the seasons so I would splurge on seasonal mantle décor. I’d buy some Christmas ornaments. Pier 1 always has such a nice selection and I like to give them to friends. I would get some Fall Candles for sure! And then some dinner plates. 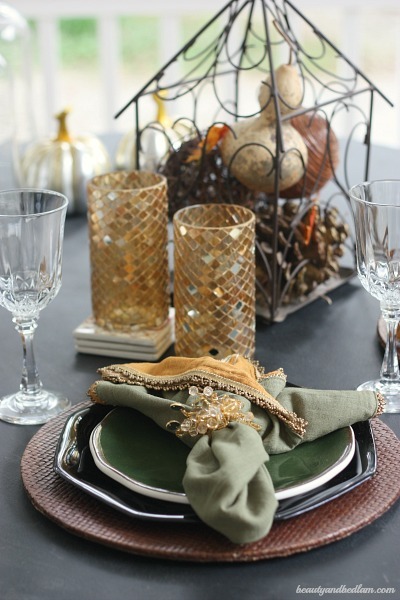 I would purchase items for my Thanksgiving and Christmas centerpieces! i love the mouth blown glass pumpkins they have! theyre so cute! I would really like to get some jazzy throw pillows for my living room.